Once a year in Tokyo, Sony invites some lucky people to check out the super-secret stuff their Computer Science Laboratories (CSL) have been cooking up. What's the CSL? It's the R&D division that explores future technologies with no specific product or division in mind, so they aren't forced to only work on Blu-ray products or phone technologies. Well, this year's open house just happened, and Sony had some pretty neat stuff to show off. 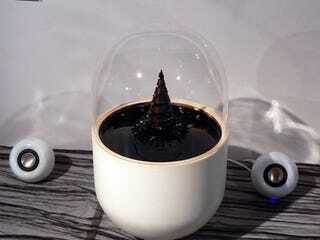 Up at the top there is a speaker with ferromagnetic nano particles inside, dancing and reacting to the music playing. Next up is ChatScape, a circular table with a projector shooting down images on it, allowing users to email photos from their phone and have them show up in real time. Think of it as a poor-man's Microsoft Surface Table. There's plenty more to check out, so head on over to Digital World Tokyo and get the whole story straight from the horse's mouth.